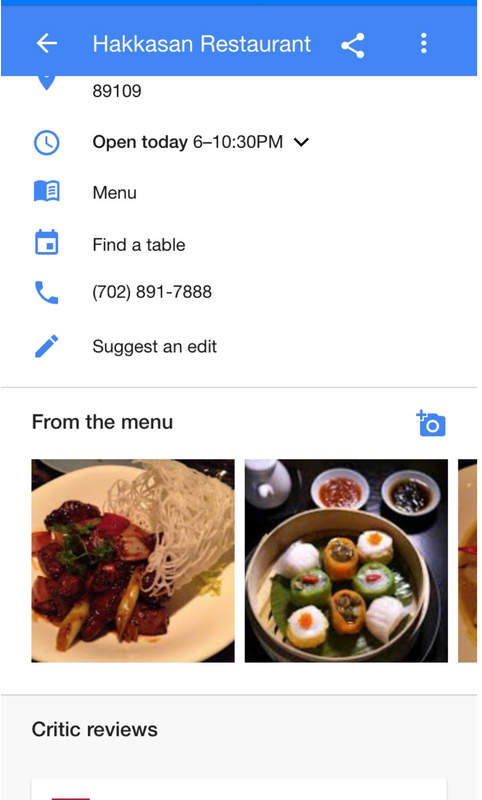 Google has added a new feature to the restaurant local knowledge panels. It is a section called “From the menu” that shows photos people have taken specifically of the food from the restaurant. Note the blue camera image on the right above the photos of dishes. 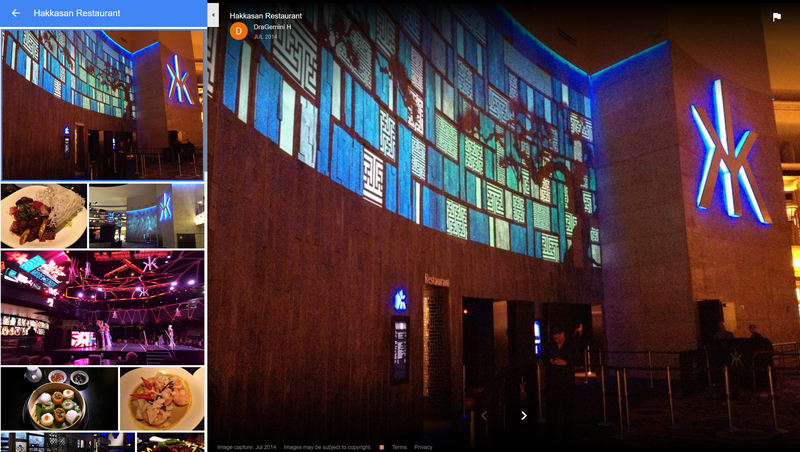 You can click this to add a photo of your meal, and theoretically you could do it right from inside the restaurant. Here is the upload process. 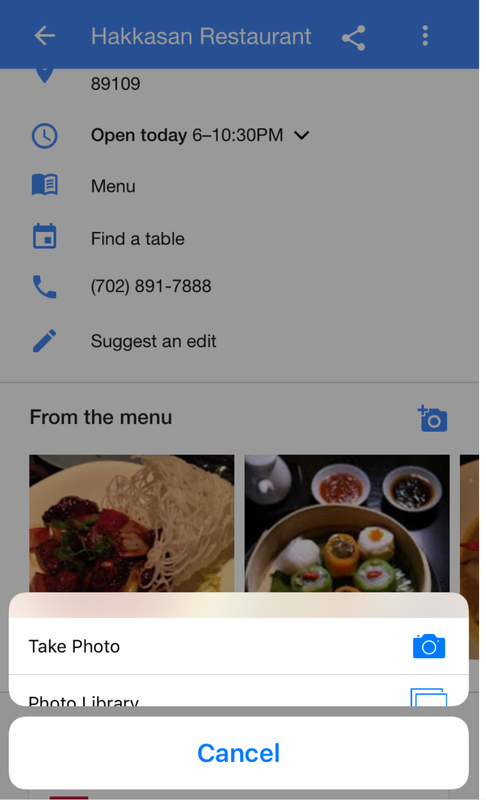 It allows you to take a photo immediately for upload – to take advantage of those at the restaurant – or upload one from saved photos on the device. It also shows on tablets. This doesn’t seem to appear on desktop however, it seems to just be a feature on mobile. Here you can see viewing the regular photos on desktop, and there is not even a prompt there to upload, most likely since most people would have these types of restaurants on their mobile device. But it does exclude the more professional photographers would might take some fabulous photos but upload them from the camera to desktop. This is a nice feature. 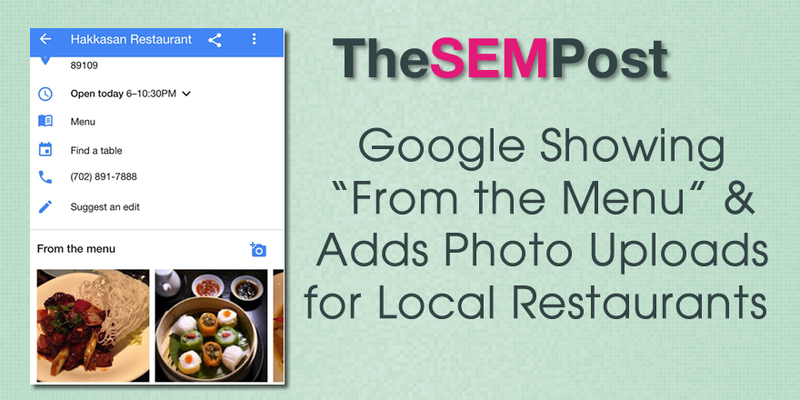 We are used to seeing so many images Google shows about the restaurant being photos of the outside or of an overview shot of the interior, but not all restaurants have as many photographs of the dishes they serve. It does expand the length of the local knowledge panel, however the panel only shows when someone is searching for the restaurant specifically, not for generic searches. Hm, I’m seeing the same knowledge panel for the same restaurant, one through brand search and one generic search, and neither show the food images. Did you expand it? When you expand it actually shows above the reviews section. I am seeing it on both Chrome and Safari. And I see it for Crack Shack. with google maps app in background, it detects when you are in a restaurant and asks you for pictures even if you disabled tracking before. I haven’t seen that personally yet. But someone else saw it but couldn’t figure out what triggered it.